Ringworm is often seen in pet cats, but despite the name, it doesn't involve any worms. Thankfully, this highly contagious infection can be avoided and treated if you simply know what to do. Ringworm is actually a fungal infection that infects many different species of animals and is also referred to as dermatophytosis or tinea corporis. Cats are often infected with this fungus since it is easily transmitted. Ringworm affects the top layer of the skin and occurs when the fungi or its spores make contact with a cat's skin. It is very similar to other fungal infections, such as athlete's foot. Ringworm lesions create hairless, scaly, red rings on the skin. They are also often quite itchy. These round lesions usually appear on the front legs, ears, or other parts of the head of a cat but can pop up anywhere, especially in severe infections. Ringworm is usually noticed when an owner is petting their cat. A small patch of hair loss is noticed first and then upon further examination, a red ring is seen in this patch of hairless skin. Cats can carry the fungal spores of ringworm and not show any symptoms of the disease, while others actually show the symptoms and are infected by the spores. The spores can spread to other cats quite easily, either directly or indirectly. In direct contact, a cat touches another animal who has ringworm in order to get the infection. With indirect contact, a cat can get ringworm simply from touching the bedding, food and water dishes, toys, and other items that a carrier or infected pet has come in contact with. Can You Get Ringworm From Your Cat? Yes, ringworm is a zoonotic disease, which means it can spread from an animal to a human. A ringworm infection in a person typically occurs after a person has pet an infected or carrier cat, but it can also occur after simply handling items that were used by an infected cat. Immune compromised individuals, such as the elderly and very young, are more prone to contracting ringworm. Wood's Lamp - Your vet may use a special black light called a Wood's lamp, which may cause the fungus to glow a green color. This is a simple and non-invasive test to perform, but it is also unfortunately not very accurate. Many other things will glow under a black light besides ringworm, including dead skin cells, topical ointments and other fibers, so this test is not usually performed as a sole indication of infection. Microsporum - Your vet may also look for the fungal spores, called microsporum, under a microscope by sticking clear tape to the lesion and applying a stain to the cells that stick to the tape. This special purple stain will cause the ringworm spores, which look like small ellipses with lines in it, to be visible under a microscope, but they can still be hard to see. Culture - One of the most accurate ways to diagnose ringworm is to take samples of your cat's fur and skin and place them on a special culture medium to see if the fungus will grow. This is unfortunately also a very slow method and can take over a week to get results. Biopsy - A skin biopsy is the most invasive way to diagnose ringworm. This method involves cutting out a piece of skin and sending it to the lab for microscopic analysis. It can take several days to get results, but is very accurate. PCR - The newest method to detect ringworm is through a polymer chain reaction test, more commonly referred to as a PCR. Like the culture test, the PCR test uses skin and hair but can detect ringworm in a very non-invasive way in only a few days. These different tests will verify that your cat has ringworm and therefore your vet will be able to treat the fungal infection with an appropriate medication. Your vet may also ask you if you have any lesions that look similar to your cat's lesions, as another indication of this zoonotic disease. Does Ringworm Look Like Other Diseases? Other things can look similar to ringworm lesions. 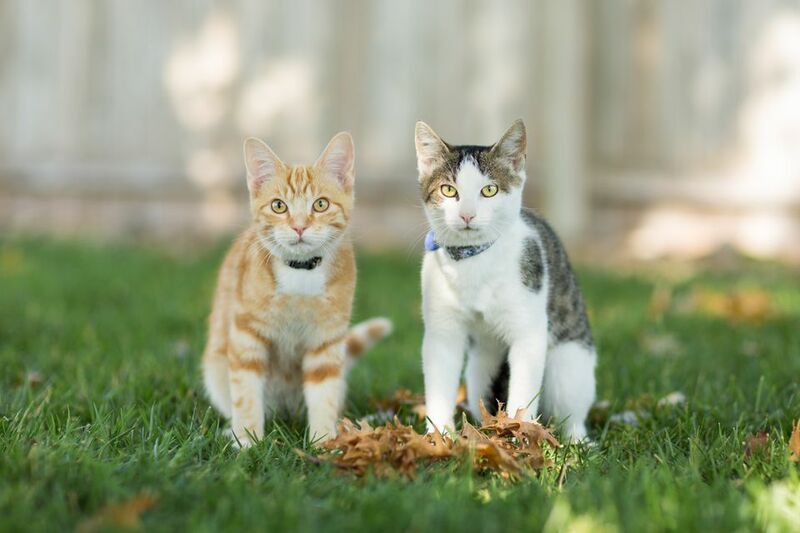 Fleas and mange (both the demodectic and sarcoptic types) can cause hair loss and itching, and some cats will lick their fur off and irritate their skin until it is red, due to allergies or stress and anxiety. You'll want to make sure you are treating the correct problem and not making matters worse by giving the wrong kind of medication. If your veterinarian has diagnosed your cat with ringworm, they will most likely prescribe an anti-fungal medication to treat the infection. Itraconazole is the most often used medication in pets with ringworm but due to the size of the capsules, it typically has to be compounded into a liquid solution in order to dose it for a cat. Sometimes topical ointments are also used to treat ringworm in conjunction with the oral treatments. By using both oral and topical treatment regimens, you will kill both the spores on the skin and suppress the infection in the cat systemically. Finally, if you have a cat with ringworm, you will need to treat the environment in order to kill any spores that remain. Diluted bleach solutions should be used after general cleaning, such as vacuuming and typical washing of surfaces, in order to kill the spores of the ringworm fungus. Ringworm is highly contagious in cats but it is also preventable if the appropriate steps are taken. Washing your hands after handling a cat and before handling your own cat is the easiest way to decrease the likelihood of you or your cat from becoming infected with ringworm. Aside from that, don't let your cat play with cats that don't live within your household, maintain a sanitary living environment for you and your cat, and if you have ringworm, refrain from touching your cat until your doctor has deemed you to be free of the infection. What's an Extramedullary Plasmacytoma, and What Is the Prognosis?